Ah, those wonderful parent days are quickly approaching, yet again this year. Yes, Mother’s Day and Father’s Day. Each year children of all ages across the country struggle with what to get their parents on those days. What is the perfect gift that sums up a years or lifetimes worth of love? In What Not to Give Your Mom on Mother’s Day, this little boy is no different. Rather than telling ideas of what to give, this little boy shares some past experiences of what NOT to give. Charming and well written, this book is well suited for second to third grade level reading. These children should easily be able to comprehend the story. Children will walk away with a comical sense of what not to give your mom. The little boy in this story has stayed away from the social convention of flowers or candy for gifts, and has opted for the unconventional. For example, most moms will not enjoy a tub of fat worms, nor chewed up shoes. There is however, a contrast/comparison of some mothers who might rather enjoy these ideas. 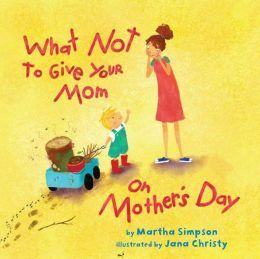 What Not to Give Your Mom on Mother’s Day, is illustrated with bright colors and whimsy, that children will enjoying looking at. In the end the little boy does come up with the perfect gift. A gift any mom would cherish from her young or old children. What is it? Pick up What Not to Give Your Mom on Mother’s Day and find out.